Friday, January 18, 2019 - SESSION FULL! Or contact us to book an alternate date with your team. * Please be reminded that this is NOT a school field trip. These workshops are meant for educators to attend only. "Power to Play was easy for me to understand and implement. I loved how much my students understood about food and nutrition when we completed the unit! If we can teach students to eat healthy and live healthier lifestyles then we truly are giving them the Power to Play!" Power to Play is a superhero themed program for grades 2&3 that explores food and drink choices that give kids the power to play. In this interactive teacher workshop you will meet "Brock Lee" and "Coco Lait". These superheroes will lead your students on healthy eating and physical activity adventures so they have the power to play, think, and feel great! Grade specific teacher guides with lesson plans and student activities. 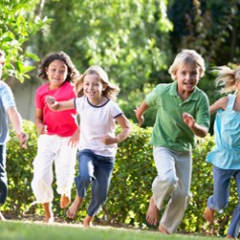 Each lesson makes physical activity fun by including an Energy Blast. Bring lessons to life as your class watches Broc Lee and Coco Lait’s adventures in healthy eating. Watch a DVD episode. Fun songs let students know about the super-food activities. Listen to a song. Contains all student activity sheets; designed for use with SMART board. A technology-based resource that extends learning in Power to Play! It highlights technology and hands-on investigation to explore a variety of food choices. A set of 10 study prints that showcase each of the four food groups, meals, active play, healthy classroom lunch and a family mealtime. Colourful, sturdy cardboard floor puzzle links food and agriculture with big pieces, great for little hands. Easier reading information tips on healthy eating for preschool children. Information, hints for parents and kids.